ACCEPT and EXCEPT are easy to confuse. They may sound the same but they have different meanings… and I have a simple tip to remember the difference between them. ACCEPT means to acknowledge, or agree to receive. To remember this, think of the AC of ACCEPT and ACKNOWLEDGE. EXCEPT means apart from, or excluding. Think of the EX of EXCEPT and EXCLUDING. Keep these tips in mind and you’ll stop making this common mistake in no time. 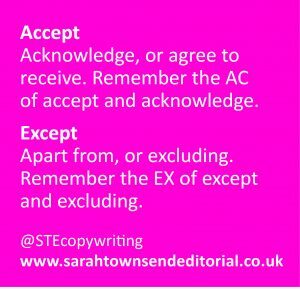 ACCEPT vs EXCEPT: which is which? Do you know the difference?